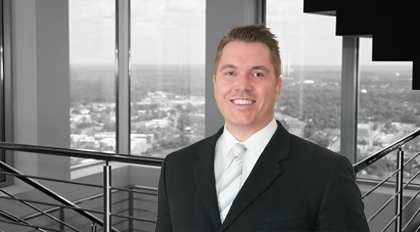 Cole Richins is an associate on Moore & Van Allen’s Bankruptcy and Restructuring Team where he advises banks, other financial institutions, equipment lessors and corporate entities in restructuring matters, corporate bankruptcies, foreclosures and collections. Cole also routinely represents administrative agents in connection with the negotiation and documentation of secured and unsecured senior syndicated financing transactions, and banks and other financial institutions in front-end secured and unsecured middle market financings. Cole has considerable experience in representing financial institutions in connection with the negotiation and preparation of intercreditor and subordination agreements, and creditors in defense of causes of action arising from claims of preferential transfers. Equipment lessor in large chapter 11 coal company bankruptcy. In re Peabody Energy Corporation, et al., Case No. 16-42529, United States Bankruptcy Court for the Eastern District of Missouri. Lender in successfully obtaining relief from the automatic stay for retail shopping center. In re Mooresville Commons, LLC, Case No. 15-50352, United States Bankruptcy Court for the Western District of North Carolina. Debtor in successful chapter 11 reorganization of 112-megawatt merchant power plant. In re Northampton Generating Company, L.P., Case No. 11-33095, United States Bankruptcy Court for the Western District of North Carolina. Various equity holders in complex chapter 11 asbestos bankruptcy. In re Garlock Sealing Technologies LLC, et al., Case No. 10-31607, United States Bankruptcy Court for the Western District of North Carolina. Defendants in successful defenses of preferential transfer claims in connection with: In re Vestis Retail Group, LLC, et al., Case No. 16-10971, United States Bankruptcy Court for the District of Delaware; In re Midstate Mills, Inc., Case No. 13-50033, United States Bankruptcy Court for the Western District of North Carolina; In re RS Legacy Corporation, et all, Case No. 15-10197, United States Bankruptcy Court for the District of Delaware. Multiple administrative agents in connection with restructurings of several franchise restaurant groups, including term loan and revolving credit facilities of $131 million, $92 million, $85 million and $14 million. Administrative agent in connection with restructuring of $300 million term loan and revolving credit facility for international trucking organization. Administrative agent in connection with restructuring of $725 million credit facility for international brand food company. Secured lender in connection with restructuring of $21 million term loan and revolving credit facility for government technology contractor. Unsecured subordinated lender with restructuring of $21 million term loan facility for internet marketing firm. Administrative agent in $3.5 billion revolving credit facility for international insurance provider. Administrative agent in $600 million capital call facility for large private equity firm. Administrative agent in $300 million revolving credit facility for real estate investment trust. Administrative agent in $227.5 million first lien term loan and revolving credit facility and $47.8 million second lien term loan facility for home health and hospice care provider.